On July 14, 2017, I was brought before a Florida Department of Corruptions (FDC) Institutional Classification Team (ICT) for a staged hearing to have me thrown in solitary confinement (euphemistically called Close Management [CM] by the FDC). As described in my recent article, “I’m off to Florida,” the basis for this recommendation was my involvement in publicizing prison abuses in other states where I’d been confined. Florida officials vowed to put a stop to my activities. Although they admitted these reasons for recommending my confinement in solitary, FDC officials gave another standardized pretext, because FDC policy lists specific grounds for which prisoners may be put in CM. The pretext given was that I am a supposed gang leader. Upon my FDC assignment they had the New Afrikan Black Panther Party (NABPP), of which I am a member, classified as a gang or Security Threat Group (STG), for the stated purpose of using that false profile to attack my propensity to publicize abuses. They claimed the general public that reads my articles and protested the reported abuses are my gang following. Following being served the first notice of the ICT hearing on July 16, 2017, which I addressed in my article, “I’m off to Florida,” I was issued an ‘amended’ notice on July 12th, upon which I was heard on July 14th. The second notice differed from the first one in only one respect — instead of using the ‘gang leader’ pretext for my CM recommendation, it claimed my publicizing prison abuses and public complaints somehow constituted actions on my part which resulted in or could have resulted in serious physical injury to someone. This second pretext was even more obviously contrived and absurd than the one it replaced. Under FDC policy I was entitled to state verbally or in writing me objections to the CM recommendation at the ICT hearing. I gave a written statement outlining the illegalities of the FDC’s and ICT’s actions, which of course had no impact — I was still thrown in solitary. However, I feel it is of public value to show yet again how lawless prison officials are, even in the face of being confronted with the very laws they are violating and as executive “law enforcement” officials they are under duty and oath to obey. In fact the ICT’s response to my statement was to tell me in antebellum terms that I have no rights. The CM recommendation and supporting comments show that FDC officials are not only lawless, but their actions and intentions against me are racist, politically intolerant and overall unconstitutional. Foremost, the STG profiling of the NABPP was conspiratorial and premeditated, and done consistent with a long-existing and long-outlawed racial prejudice that has always operated, in the U.S. South especially, to strip and deny New Afrikans/Black political representation of our own choice and the right to vote, and to suppress Communist groups which were always repressed because of their opposition to racial prejudice and segregation. This is unconstitutional racial and political discrimination and denial of the right to political expression and association. The NABPP is an above-ground, Communist, non-violent, anti-racist, predominantly New Afrikan/Black (minority) political party. The U.S. Supreme Court has long held that such “minority dissident groups” have the same First Amendment right to “engage in political expression and association” as do “our two major political parties.” NAACP v. Button, 371 U.S. 415, 431 (1963). And the Court has long outlawed censorship and discrimination against Communist groups by government officials. See, Brandenburg v. Ohio, 395 U.S. 444 (1969). The FDC plot of STG/gang profiling the NABPP, which has neither done nor promotes anything illegal, nor ‘hate’ nor gang-related, simply demonstrates that FDC officials still practice a level of open racism and political intolerance such as was outlawed over a half-century ago when open racism and racial segregation were the norm. In fact efforts to repress Black political self-representation and voting rights was the very reason the Ku Klux Klan and other white supremacist terrorist groups were formed following the Civil War, which groups as now have always worked with and within Southern government institutions. This scheme to suppress the NABPP by “gang” profiling it is an old racist practice that is well recognized. As Justice Black stated long ago, “History should teach us … that … minority parties and groups which advocate extremely unpopular social or governmental innovations will always be typed as criminal ganges and attempts will be made to drive them out.” Barenblatt v. U.S., 360 U.S. 109, 150 (1959). More telling is that the FDC doesn’t use its selectively applied, vague and overbroad criteria that it uses to STG profile and repress groups it dislikes against either of the two mainstream majority white capitalist political parties, namely the Republican and Democrats. This is clearly racial and political discrimination, especially where FDC officials are allowed to join and support these parties, and more so where since the 1960s the Republican Party replaced the Democrats as the representatives of Southern white supremacist electorate called the ‘Silent Majority’. Also this Party’s present president, Donald Trump, is a known racist, housing discriminator, a habitual sexual assaulter of women, and has neo-Nazis like Steve Bannon as key advisors of his administration. I should add that I was told on June 22, 2017 — my first day in the FDC — by a Sergeant L. Colon that he and the FDC knew nothing about the NABPP except that it was a “Black” group, but he was tasked to STG profile it “for approval by Tallahassee,” which would be used to stop my publicizing prison abuses, which I wrote to a lawyer that works with the Abolitionist Law Center in Pittsburgh, PA in a date — stamped letter on June 23rd, and just as was threatened by Sgt. Colon, this is exactly what is being done now. So, as a threshold matter, the STG profiling of the NABPP and me is unconstitutional per se. Next up, I am admittedly being targeted for indefinite torturous solitary confinement (euphemistically called CM here in FDC) for my political association/expression/affiliation with the NABPP (a constitutional right as set out above) and my publicizing through published outlets prison abuses. This is portrayed as a threat to security. It is also admitted that the actual reason I’ve been interstate transferred now and in the past is because of my publicizing abuses. This is all again outright illegal. Prisoners have a First Amendment right to have people post information by and about them online. Death Penalty v. Ryan, 269 F.Supp 2d 1199, 1202-03 (2003). In this context the courts have specifically held that, “punishing a prisoner for a complaint about medical care that his mother put on the internet violated the First Amendment.” Cassels v. Sadler, 342 F.Supp 2d 555 (2004). Prisoners have a constitutional right to have their writings published. 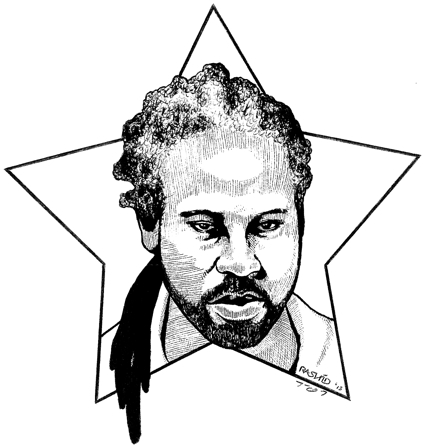 Abu Jamal v. Price, 154 F.3d 128, 134-36 (1998). And officials may not retaliate against prisoners for exercising their right to free speech and press. Graham v. Henderson, 395 F.3d 372 (2002). “[W]hether the retaliation takes the form of property or privileges does not matter.” DeTamaso v. McGinnis, 970 F.2d 211, 214 (1992). By being thrown in CM I will be denied both property and privileges enjoyed by general population prisoners. This recommendation then goes so far as to ridiculously portray as ‘gang’ activity that the general public reads my writings online (actually my articles and art are published in a variety of media — print and online), and have in turn protested the conditions and abuses I’ve reported. Interestingly, in the minds of FDC officials nothing is wrong with the lawless and inhumane actions of prison officials that I report, rather their only concern is that it’s being exposed to the public. The courts have specifically held that prisoners’ right to publicize government conduct through the media to the public to generate protest is part of the First Amendment right to petition the government the redress of grievances. Guajardo v. Estelle, 580 F.2d 748, 758 (1978). Communicating grievances to government officials via phone calls, the mails, emails, etc. is the most basic and traditional method of lobbying and voicing public protest against disagreeable government conduct in so-called democratic societies. This all shows that FDC officials are perversely and absurdly twisting perfectly legal and constitutionally protected actions on my, the public’s and the media’s parts, to speciously rationalize totally illegal designs on their own part. Only a vague and passing reference is made to disciplinary infractions I allegedly incurred in other states. No effort is made nor can it be shown that any of them had anything to do with the NABPP or my role in this Party; nor that these infractions records are even particularly dangerous or serious, especially in comparison with those whose records are far worse by haven’t been bounced from state-to-state as a result. And absolutely nothing is even hinted at that shows any actions by me that did or could cause anyone any physical harm at all. Everything I am described to have done is legal and constitutionally protected activity, as I’ve shown above. The very recommendation for CM assignment is illegal and reveals the most blatantly racist and unconstitutional designs of FDC officials. I should not only not be put in CM, but should be removed immediately from FDC custody where it is revealed from the outset that the designs of its officials against me are plainly racist, and lawless, and the admitted motive is to retaliate against and suppress my exposing prison abuses to the general public which is my, the public’s and the media’s right. As stated, the foregoing statement had no bearing on the ICT’s decision to throw me in solitary. In fact the hearing was only a formality — it had already been decided beforehand by the ICT and FDC’s HQ officials to put me in CM. Indeed, as I was being ‘escorted’ from my cell to the hearing by a Sgt. John Nyitray, he asked if my property was already packed or stored in such a way inside my cell that he could quickly put it all into a bag. I asked why, to which he replied I was going to be transferred immediately following the hearing. I’d already been told by various sources that if I was put in CM I’d likely be sent to Florida State Prison’s (FSP) CM unit, which was less than a thirty minutes drive from FDC’s Reception and Medical Center (RMC) where I was then confined. It was then approaching 5pm, and only emergency transfers authorized by FDC’s HQ in Tallahassee are done at such a late hour. And so it was. Immediately following the staged ‘hearing’ where I was told by RMS’s assistant warden Polk that I have no rights, I was returned to my cell, instructed to pack my things, and was then promptly transferred to FSP’s CM unity, where I remain. How more obvious could a corrupt conspiracy orchestrated at the highest levels of authority be? How more blatant could officials be in their designs to suppress and punish the public’s inalienable right to know what a government that professes to be theirs is up to? How more evident could it be that the government is not theirs and they must therefore rein it in and replace it with one that genuinely is — of the People, by the People, for the People.